Jive comes in three sizes to fit any size dog. 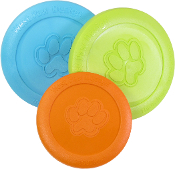 The large size dog ball is 3.5", small ball is 2.6" and mini size for small dog breeds is only 2". Small fits in standard ball thrower. Mini fits in mini ball thrower. Depending on inventory colors will vary.